The traditional photo program that provides quick service at a low cost. Prepaid one pose, one background, easy to administer. Prepay and pre-select a pose and background prior to Picture Day. Over a hundred background choices online! Students pre-select a pose set and receive their proof images on an order form. All four poses can be purchased with different backgrounds. 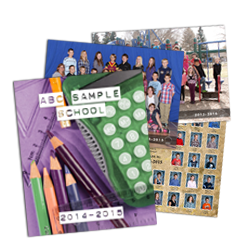 Add-ons available with the Studio Style and Proof Style School day programs: Class Picture, Class Composite and Memory Book. Our school services provide schools with much needed resources that aid in the day to day management of student services, including: Photo ID Cards, various administrative CDs, student and staff picture directories, portrait sheets, Yearbook CDs and many more. Celebrate the school year with group photos! We offer class pictures, whole school groups, farewell groups, as well as full composite photo services. Group options can be added to any photo program or be chosen as a stand-alone service.